Obesity and dysglycaemia are major risk factors for type 2 diabetes. We determined if obese people undergoing laparoscopic adjustable gastric banding (LAGB) had a reduced risk of progressing from impaired fasting glucose (IFG) to diabetes. This was a retrospective cohort study of obese people with IFG who underwent LAGB. Weight and diabetes outcomes after a minimum follow-up period of 4 years (mean ± SD 6.1 ± 1.7 years) were compared with those of Australian adults with IFG from a population-based study (AusDiab). We identified 281 LAGB patients with baseline IFG. Their mean ± SD age and BMI were 46 ± 9 years and 46 ± 9 kg/m2, respectively. 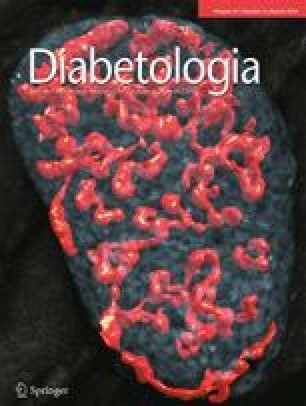 The diabetes incidence for patients in the lowest, middle and highest weight loss tertile were 19.1, 3.4 and 1.8 cases/1,000 person-years, respectively. The AusDiab cohort had a lower BMI (28 ± 5 kg/m2) and a diabetes incidence of 12.5 cases/1,000 person-years. This increased to 20.5 cases/1,000 person-years when analysis was restricted to the 322 obese AusDiab participants, which was higher than the overall rate of 8.2 cases/1,000 person-years seen in the LAGB group (p = 0.02). Multivariable analysis of the combined LAGB and AusDiab data suggested that LAGB was associated with ∼75% lower risk of diabetes (OR 0.24 [95% CI 0.10, 0.57], p = 0.004). In obese people with IFG, weight loss after LAGB is associated with a substantially reduced risk of progressing to diabetes over ≥4 years. Bariatric surgery may be an effective diabetes prevention strategy in this population. John M. Wentworth and Tamishta Hensman contributed equally to this work. We are grateful to our patients and the participants of the AusDiab Study. We thank M. Mehmet and A. McNeil for assistance with collating biochemical data. Also, for their invaluable contribution to the set-up and field activities of AusDiab, we are enormously grateful to A. Allman, B. Atkins, S. Bennett, A. Bonney, S. Chadban, M. de Courten, M. Dalton, D. Dunstan, T. Dwyer, H. Jahangir, D. Jolley, D. McCarty, A. Meehan, N. Meinig, S. Murray, K. O’Dea, K. Polkinghorne, P. Phillips, C. Reid, A. Stewart, R. Tapp, H. Taylor, T. Welborn, T. Whalen, F. Wilson and P. Zimmet. The work was funded primarily by the Monash University Centre for Obesity Research and Education. It was supported by Victorian State Government Operational Infrastructure Support and Australian Government NHMRC IRIISS. JES is supported by a National Health and Medical Research Council Fellowship (586623). The AusDiab Study, co-coordinated by the Baker IDI Heart and the Diabetes Institute, gratefully acknowledges the generous support given by: National Health and Medical Research Council (NHMRC grant 233200); Australian Government Department of Health and Ageing; Abbott Australasia; Alphapharm; AstraZeneca; Bristol-Myers Squibb; City Health Centre-Diabetes Service – Canberra; Department of Health and Community Services – Northern Territory; Department of Health and Human Services – Tasmania; Department of Health – New South Wales; Department of Health – Western Australia; Department of Health – South Australia; Department of Human Services – Victoria; Diabetes Australia; Diabetes Australia Northern Territory; Eli Lilly Australia; Estate of the Late Edward Wilson; GlaxoSmithKline; Jack Brockhoff Foundation; Janssen-Cilag; Kidney Health Australia; Marian & FH Flack Trust; Menzies Research Institute; Merck Sharp & Dohme; Novartis Pharmaceuticals; Novo Nordisk Pharmaceuticals; Pfizer; Pratt Foundation; Queensland Health; Roche Diagnostics Australia; Royal Prince Alfred Hospital, Sydney; Sanofi Aventis; Sanofi-synthelabo; and the Victorian Government’s OIS Program. The Centre for Obesity Research and Education (CORE) at Monash University receives grants from Allergan and Applied Medical for research and educational support. The grants are not tied to any specified research projects and the grantors have no control over the protocol, analysis and reporting of any studies. All authors contributed to conception and design, acquisition of data, analysis and interpretation of data. JMW and PEO drafted the manuscript and revised it with all other authors, who also approved the final version. JMW takes full responsibility for the work as a whole, including the study design, access to data, and the decision to submit and publish the manuscript.